A quarter-mile offshore and 80 feet below the surfaceof Lake Superior, my friend, Chris, and I found the Madeira’s pilothouse — standing upright, its compass binnacle still intact, belying the violence of the ship’s demise. The rest of the wreck is strewn over an acre of lakebed — twisted bollards, winches torn free and the bow facing upright, its nose only 40 feet below the surface. November has always been a cruel month for sailors on Lake Superior, but November of 1905 was perhaps the worst since the big lake was opened to navigation in 1855. Seventy-eight lives were lost and 19 ships sunk in storms that month, including the infamous “Mataafa Blow”, which packed 60mph winds and sank a dozen ships. It was during this storm that the 436-foot steel schooner barge, Madeira, was driven against Gold Rock cliff on Superior’s rugged North Shore. Battered by short-frequency freshwater waves, Madeiraquickly filled and sank, and her bones were scattered at the base of the cliff by ice and wave action over the ensuing decades. 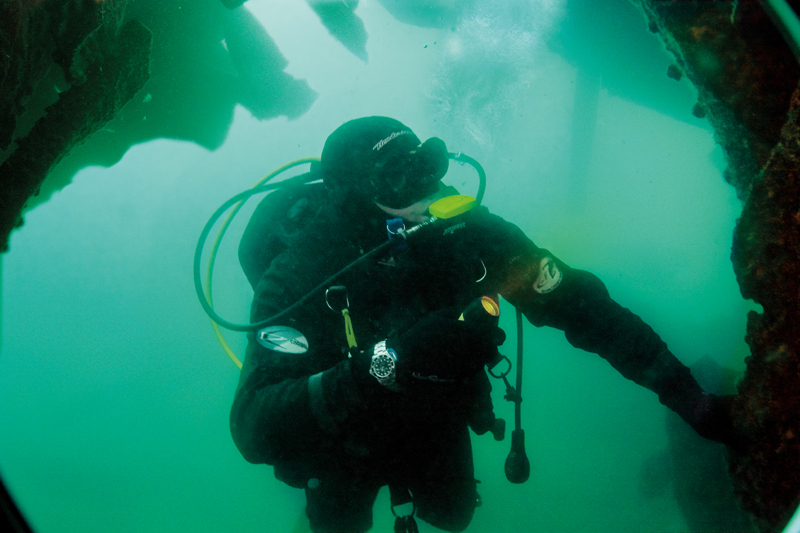 It is fitting, then, that on a chilly November morning, over a century later, I found myself exploring this historic wreck site, with an equally historic dive watch strapped to my wrist: the Rolex Submariner. How does one review arguably the most ubiquitous, copied, clichéd and iconic watch ever made? It’s not easy, and it’s slightly intimidating. There is little about the Rolex Submariner that hasn’t already been written — its legendary use for exploration and combat, its famous wearers, its durable and accurate movement. But as hard as I searched, I couldn’t find any hands-on reviews of the watch being used as it was intended. So, I went back to its roots and took it diving. And there, underwater, despite its nearly 60-year-old design, the Submariner still fared well and seemed right at home. The Submariner has evolved at roughly the same pace as another well-known denizen of the deep: the shark. And the specific reference I tested, the “No Date” 14060M, is perhaps the purest example. With no ceramic bezel insert, no Glidelock clasp, no Chromalight lume, not even solid bracelet links, the 14060M Submariner is a dinosaur, a relic from the past. Strapping on this watch for a dive is like stepping into a time machine and being transported back to the mid-1950s, a time when sport diving was in its infancy and dive watches were built to be instruments, not fashion statements. It was during this era, in 1955 specifically, that members of the Frigid Frogs diving club from Duluth, Minnesota, first explored the wreck of the Madeira. Lake Superior is the largest freshwater lake in the world, truly an inland sea, and her waters have long been plied by ships carrying lumber, grain and iron ore to ports east such as Chicago, Cleveland and Detroit, and to the Atlantic via the St. Lawrence Seaway. But to sail on Superior is to risk the ferocious storms that have sunk over 350 ships and claimed hundreds of lives. A potent combination of capricious weather, frigid water and a jagged shoreline has garnered the lake healthy respect among mariners. The cold water also means that the ships that wreck in Superior remain pristine — untroubled by destructive sea life and frozen in the lake’s clear, emerald-green water column, which is mercifully free of the floating particulates that plague other, warmer bodies of fresh water. Of course, cold water means drysuit diving; with a bottom temperature hovering around 40°F (about 5°C) year-round, a wetsuit just isn’t warm enough. Looking out at the choppy surface swim ahead of us, I pulled on my hood, zipped up the bulky suit, snapped open the Submariner’s dive extension, and pulled the watch over my 5mm neoprene gloves. While the Submariner’s big brother, the Sea-Dweller, has a longer extension made for thicker sleeves, I found the watch fit fine around my wrist, the Fliplock snapping down securely. Watch fans long grumbled about the Sub’s archaic bracelet and clasp, and rejoiced when the new and improved one finally came onto the scene a couple of years ago. And indeed, the new Glidelock clasp is a work of art. But I’m not ready to write off the old, much-maligned Oyster bracelet and clasp just yet. While the new clasp can be micro-adjusted for precise fit on the fly, its more complex mechanism is a potential trap for sand and debris. The venerable Oysterlock clasp, with its hollow, pressed-steel design, sheds debris with ease and remains reliable in all conditions. And it can be adjusted in minute increments to accommodate a tropics-swollen wrist or thicker wetsuit using nothing more than a toothpick. 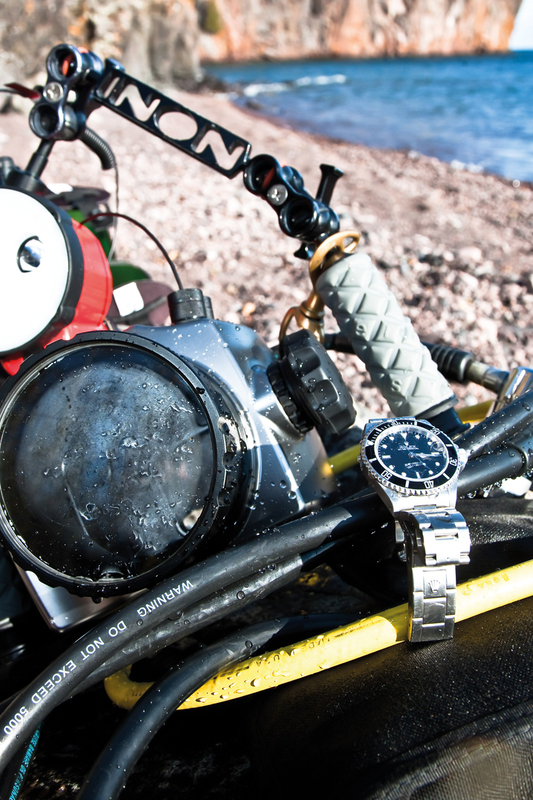 With dive watches today more talismans than tools — objects of fetish more than instruments — people expect ridiculous depth ratings, massive diameters and gimmicks like locking bezels and helium relief valves. But where a tool watch should shine is in adverse conditions, where its user needs it to be simple and reliable. The Rolex excels here. Its 40mm diameter and modest height are near perfect, allowing it to resist snags on gear and fit under a shirtsleeve, at a weight that’s comfortable to wear. The bezel can be pried off with a dive knife (or butter knife) for rinsing out sand, and snapped back into place. The bracelet can be removed with a safety pin, thanks to the drilled lugs, so a nylon strap can be quickly fitted. The dial and hands are distinctive, lacking even a date, which makes tracking time intuitive. The Submariner is a tool watch ne plus ultra. And while it may see more time in boardrooms than shipwrecks these days, there is no denying its origins. The mid-1950s saw the dawn of sport diving, when the newly developed self-contained underwater breathing apparatus (SCUBA) opened doors for the average adventurer to explore the reefs and wrecks of the sea. 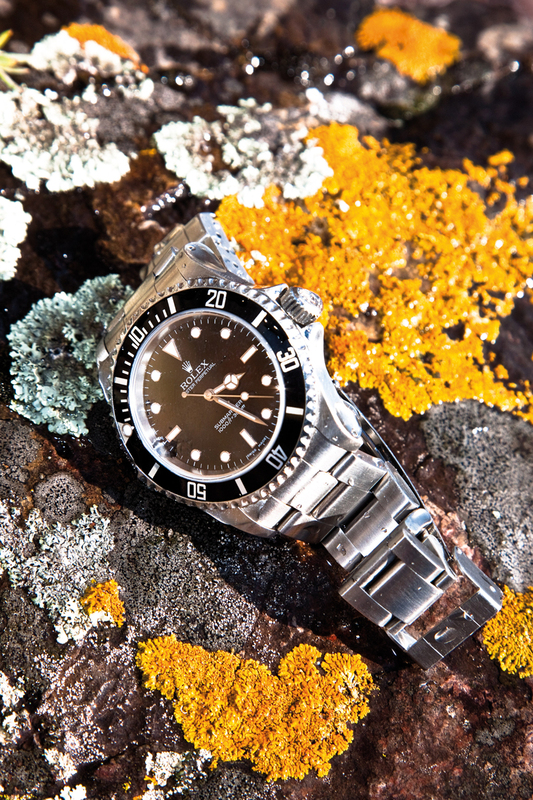 Since time and depth are vital pieces of data to a diver, watch companies scrambled to develop diving-specific watches. Rolex and Blancpain both like to lay claim to being the first to introduce a dive watch to the public. But it is undeniable that it was the Submariner that won the battles of popularity and longevity. And while the Sub hasn’t changed much in appearance, it has evolved according to need over its long life, with subtle changes to its crown, case, bracelet, dial, bezel and, of course, its movement. The caliber 3130 that powers the 14060M is not a pretty motor, lacking all but the most basic decoration. But it is highly efficient and very durable, thanks to a bidirectional, low-friction winding rotor and a free-sprung balance that is held in place by a full bridge for maximum shock resistance. Though the 14060M that I tested lacked the “superlative chronometer” pronouncement on its dial, it kept time well within chronometer limits, despite almost-constant wrist time and ample abuse. That abuse included a difficult, stumbling shore entry on the beach below Gold Rock cliff. Wading in backwards in my fins and clutching US$4,000 worth of underwater camera gear, I plunged into the bracing water and started the long swim out to the buoy that marks the wreck site. Though the sun was brilliant, the wind was cold and waves crashed against the bottom of the cliff to my right. It is difficult to imagine the scene from 1905, when the waves pounded the Madeira against this same cliff, ice-rimmed in the freezing temperatures and blowing snow. As the ship broke up, a brave crewman, Fred Benson, leaped to the cliff, rope in hand, and climbed up to the top. From there, he was able to throw a line down to the stricken vessel, and all but the ship’s first mate were able to climb to safety. Daylight faded as Chris and I descended down the line to the wreck, and through the green water, the site came into view. I gave the bezel a twist to align the descent marker to the minute hand. Even with heavy gloves on, the fluted edges of the flat bezel are surprisingly easy to grip. The water stung my exposed face and a dull ice-cream headache settled in as we reached the bottom and started to explore the ruptured and scattered hull. Swimming into the maw of the wreck’s capsized stern section, only pinpoint shafts of green-tinted light filtered through portholes to cut the gloaming. I glanced at the Submariner’s dial and got a measure of comfort upon seeing its dial markers glowing and its sweep seconds hand marching along, business as usual. This is a watch whose lineage has seen far worse, and its confidence is contagious. We swam deeper down the scree slope to the sandy bottom — near 80 feet — when the ghostly pilothouse morphed into view, green daylight leaking through its exploded roof and out vacant window frames. We hovered at the spot long enough for a few photos before moving on into shallower depths at the cliff’s base. Soon, it was time to head up to sunlight. (In this frigid water, a diver gulps through air faster than normal. And the relative warmth of the surface beckoned.) The Submariner’s bezel tracked a bottom time of 43 minutes. After a three-minute safety stop in the relatively balmy water temperatures at 15 feet, Chris and I ascended and swam back to the beach. Feeling gravity again in our heavy gear, we crawled across the rocks on all fours like early sea creatures testing unwieldy legs for the first time before collapsing in exhaustion, mission accomplished. The loss of so many ships and lives during the Mataafa Blow prompted action. By 1910, a lighthouse had been erected on a promontory above the mouth of the nearby Split Rock River to warn ships of the treacherous coastline. The lighthouse still exists today as a tourist attraction. From it, you can see Gold Rock cliff and the buoy marking the last resting place of the Madeira. After loading our dive gear back into the car and chatting through a well-earned cup of tea, Chris and I stopped there. Outside the gift shop, we watched as kids posed for photos with their fathers in front of the huge anchor that was salvaged from the Madeira. I caught the flash of a dive watch, indeed a Rolex, on the wrist of one dad and smiled, knowing that my trusty Submariner had just posed with me inside the pilothouse out there in the cold, deep lake. There was much fanfare the past two years when, at the annual Basel watch fairs, Rolex trotted out the new, improved Submariner Dates — first in white gold, then in steel. Broader-shouldered, with ceramic bezels and solid Glidelock clasps, these watches were the evolutionary step so many waited for. But there were many, including me, who wondered what would become of the venerable Submariner — the original “No Date” model. Would it, too, get the updates that the Date did, or be discontinued, quietly shuffled off to retirement after so many years of service? But on last check, the reference 14060M “No Date”, rightful bearer of the name Submariner”, is still shown on the Rolex website. And this writer and diver hopes it will remain there in its current form. It is the last holdout from a time when Rolex watches were symbols of adventure and living fossils from the golden age of exploration.